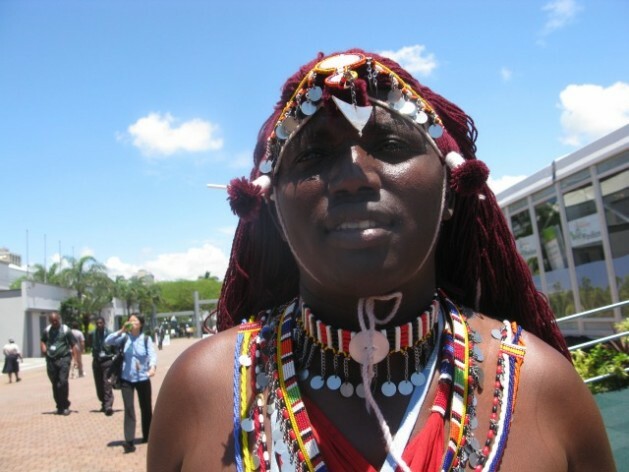 DURBAN, South Africa, Dec 8 2011 (IPS) - For the Laibon community, a sub-tribe of Kenya’s Maasai ethnic group, the 33,000-hectare Loita Forest in the country’s Rift Valley Province is more than just a forest. It is a shrine. “It is our shrine. Our Gods live there. We gather herbs from the place. We use it for bee- keeping. It therefore forms part of our livelihood,” said Olonana Ole Pulei, who is in Durban, South Africa, to represent his community at the ongoing 17th Conference of Parties under the United Nations Framework Convention on Climate Change. According to Nigel Crawhall, the Director of Secretariat for the Indigenous Peoples of Africa Co-ordinating Committee (IPACC), different African communities have incredible indigenous knowledge that they use in the conservation of forests and biodiversity in general, and this should be recognised during the negotiations in Durban. “Different communities have different practices that they use in forestry conservation,” he said. Crawhall gave an example of how the Bambuti and Batwa pygmy communities, in the eastern Democratic Republic of Congo, conserved the forest using traditional methods. Both communities depend on the biodiversity of animal life in the equatorial forests in order to survive. “Usually, they know how to identify particular trees that can be cut down in order to create a unique opening on the canopy, which attracts light in the closely-packed Congo forests. The light then attracts animals, birds and insects, thus giving them an opportunity to hunt,” Crawhall told IPS. This helps conserve the biodiversity, as well as the forests because this method can only work if the forest canopy is intact. In Kenya, the Maasai culture forbids any community member from cutting down a tree, either for firewood or any other purpose. People are also forbidden from interfering with the taproots or removing the entire bark of a tree for herbal extraction. According to their cultural belief, one can only use tree branches for firewood, and fibrous roots for herbs. If the bark of a tree has medicinal value, then only small portions of it can be removed by creating a “V” in the bark. The wound is then sealed using wet soil. “We believe that the soil helps in healing the wound on a tree. This is cultural, and we all believe that it is an abomination for one to injure a tree, and not help it heal,” said Ole Pulei. It is a practice that has been passed down from generation to generation among Maasai community members. Among the Laibon community, it is this indigenous knowledge that has aided in the conservation of the Loita Forest. “All logging activities observed on Maasai land, including the destruction of the Mau Forest, are done by foreigners because the Maasai culture does not allow such activities. This is the indigenous knowledge that helps in forest conservation,” Ole Pulei told IPS. Such beliefs make the forests part of the community, where community members have feelings for the trees, and where cutting down a tree could amount to an offence against the Gods and their culture. “We have several other communities all over the continent who co-exist with forests. They include the Tuareg community in Algeria, Yiaku community in Kenya’s Laikipia region, the Ogiek community also in Kenya, the Kung community in Botswana among others,” said Crawhall. Though according to Crawhall, all Africans are indigenous although there are some groups who live by hunting and gathering, while other groups practice pastoralism, and others practice dry-land farming. Despite the fact that there is no standard definition of indigenous people, the 2007 United Nations Declaration on the Rights of Indigenous Peoples recognises that particular communities, due to historical and environmental circumstances, have found themselves outside the state system and underrepresented in governance. “The Bushmen of the Southern African region, or the Ogiek community in Kenya who live in forests are a typical example of groupings categorised as indigenous,” said Crawhall. He points out that Africa has more than 40 groupings in different countries that survive entirely on hunting and gathering. However, IPACC works closely with 155 communities from 22 African countries who are recognised as indigenous because of their historical and environmental circumstances. As a result, representatives from these communities have joined the rest of the world in Durban to have their voices heard, so that their contributions to forest conservation are recognised as part of the climate change mitigation and adaptation efforts. “We believe that African traditional ecological knowledge is the foundation for appropriate and effective national adaptation policies,” said Crawhall. Through the IPACC secretariat, the 155 community-based organisations in Africa have drafted their position for the Durban negotiation platform. They want the negotiators to come up with a position that is representative to African parties, indigenous African people’s organisations, traditional institutions, traditional authorities and value systems. They are calling for the formation of a regional body that is legally binding under the United Nations, to handle issues on conservation that are difficult to deal with at national level. “One of the prevailing gaps in most of the IPACC-member countries is that there is no land tenure for communities who live in forests, or depend on forests,” said Crawhall. However, different countries have started responding to the needs of their local communities by including them in their national climate change adaptation strategies, with Kenya taking the lead. The country is in the process of drafting the Climate Change Adaptation Bill. And the indigenous communities will have their say on the bill because according to the constitution, they must be consulted on draft legislation so that they can make contributions. “We have traversed the entire country seeking views on this bill, where local communities have been able to give their contributions. Our vision is to participate and lead in the development and implementation of climate change sensitive policies, projects and activities within and outside our Kenyan borders,” said John Kioli, the chairman for the Kenya Climate Change Working Group, who is attending the Durban climate change negotiations. * This article is one of a series supported by the Climate and Development Knowledge Network.